The difference between indica and sativa marijuana strains: cultivation, medical uses, and the indica vs sativa high. The two major sub-species of cannabis are indica and sativa, both of which have distinctive features and highs. For novices in the marijuana realm, learning exactly how indica vs sativa characteristics contribute to the effects and benefits of different strains can be helpful. Because indica and sativa effects are quite distinct, understanding the difference between them can help cannabis consumers better customize the high they receive when consuming marijuana recreationally or medicinally. Learning the difference between indica and sativa is helpful both for recreational and medical consumption. When choosing between different types of marijuana, experienced consumers know to choose between sativa or indica based on how they’d like to feel. While both sub-species of marijuana can produce highs, an indica vs sativa high can create wildly different effects. For sativas, the high is the opposite; it is cerebral, uplifting, and can encourage creativity. An excellent way to explain a sativa high vs indica high is that sativa buds produce a high that is concentrated in the head while an indica high is focused throughout the body. The difference between indica vs sativa effects means that individuals can choose their ideal cannabis strain based on their personal preference and the goals they’d like to achieve by consuming. While an indica would be an excellent choice to help relieve stress and improve sleep quality, a sativa strain would work well for someone who needs an intense amount of focus to get work done or to get creative with artwork or music. It makes sense, then, that sativas are best consumed during the day while indicas are optimal at nighttime. It follows that choosing a balanced hybrid can give consumers the best of both worlds. Alternately, selecting a strain that has more indica qualities than sativa (or vice versa) can offer a blend that provides the desired benefits. The difference between indica and sativa effects are a relaxing “body” high versus a stimulating “head” high. The difference in a sativa high vs an indica high is due to the varying levels of THC (tetrahydrocannabinol), CBD (cannabidiol), and terpenes in each strain. THC can cause extreme feelings of relaxation along with a euphoric high. It’s an excellent pain reliever and is also often used to calm nausea and stimulate appetite. In some people, THC can cause agitation and anxiety. CBD is not psychoactive like THC, which means that CBD does not cause an intoxicating high. It’s known to relax and even cause drowsiness at higher doses. Like THC, CBD is good for pain relief. It’s also known to increase levels of anandamide – a natural antidepressant. Terpenes are compounds that impart specific flavors, aromas, and effects to marijuana. Along with cannabinoids, terpenes are thought to be responsible for the difference in indica and sativa effects. For example, linalool is a terpene with anti-anxiety properties, while myrcene is known for its pain-killing effects. Terpenes may explain why a sativa strain that’s high in relaxing CBD can still invigorate and increase someone’s productivity. While the difference between indica and sativa effects matter to many recreational marijuana consumers, they’re of particular importance to those who need it for medical purposes. Researching the characteristics of each sub-species and understanding the makeup of different marijuana strains can help medical patients tailor their treatment to target specific symptoms and harness the medical benefits of marijuana. Sativa cannabis strains are uplifting, energizing, and can often be found with high amounts of CBD – a cannabinoid that’s been proven to be effective against depression. In the choice between sativa and indica, sativa strains are often more ideal for depression because they stimulate the desire to get up, go out, and be productive. Prescription ADHD medications such as Ritalin or Adderall are stimulants that work well to calm and focus the brains of people of people with ADHD. The key difference between an indica vs sativa high is that the latter is stimulating – affecting the brains of ADHD suffers much in the same way as prescription medications for their condition. Using sativa strains of marijuana for ADHD can provide the focus needed to get things accomplished without unwanted pharmaceutical side effects. Sativa strains of marijuana are also good for stimulating hunger, which is important for people who are experiencing wasting as a result of cancer treatments or HIV/AIDS. THC is also excellent at calming nausea and vomiting – another reason it’s a popular natural treatment for cancer patients. Indica-dominant weed strains can be extremely sedating and are often taken as a remedy for insomnia. Usually, this type of strain is consumed by medical patients at night or just before bed. When choosing an indica vs sativa for pain, it’s essential to consider the “body” high that results from consuming indica strains. This makes them particularly effective at relaxing muscles and easing body pain. There are a variety of over-the-counter and pharmaceutical medications available for severe headaches such as migraines, but some people either don’t respond to these treatments or can’t withstand the side effects. Marijuana – and particularly indica strains – can be an effective treatment for people who suffer from migraines. The difference between indica and sativa runs far beyond just their effects; the plants’ similarities begin to diverge from the moment they sprout. When it comes to comparing indica vs sativa, leaves, plants, and even the nugs are different once the material is harvested. The ideal climate conditions for growing indica versus sativa are not the same. For sativas, warm temperatures are optimal; they thrive in places such as Mexico, Africa, Brazil, or Thailand. Meanwhile, indicas mature better in colder climates such as Turkey or Morocco. Another aspect to consider when deciding whether to grow indica or sativa is the ability to grow indoor or outdoor. While indica plants are ideal for indoor growing, sativas are best grown outside due to their height. Of course, as any good grower knows, plant genetics can be modified to create a hybrid of the two types that will do well in the chosen growing environment. For example, a sativa-dominant strain that will grow shorter than a pure sativa would be great for an indoor grower with a low ceiling height. 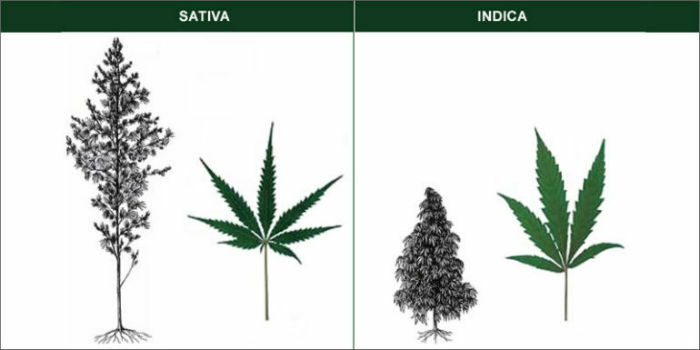 The appearances of sativa vs indica when the plants mature are also quite different. Sativas are usually tall and slim in shape; their height can reach twenty feet or more. Most indicas, on the other hand, are short and bushy; they typically grow only three or four feet high. The buds also differ; they are usually denser on indica plants than sativas, although sativa buds are typically the stickier of the two. As for the branches of the plants, sativas tend to be longer and more spread out than indica branches. Regarding the leaves, indicas often have wider and broader leaves than sativas, as well as their leaves being a darker green color than those of sativa plants. As for the leaves of hybrids, which form the majority of plants grown and cultivated, they can have either leaf shape or be a combination of the two. 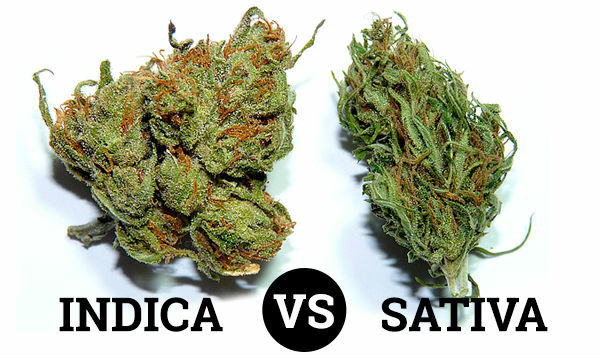 Sativa and indica cannabis differ in appearance. The amount of time it takes for sativa versus indica plants to flower before it’s time to harvest is another characteristic difference between the two. Sativa plants take longer to mature or produce buds than indicas because they have less chlorophyll. Indicas typically have a flowering time of 45 to 60 days, while sativas take 60 to 90 days to finish blooming. However, sativa strains usually require less time in the vegetative growth stage than indicas, so the overall grow time is roughly the same overall. As for the difference between indica and sativa in terms of yield, sativas tend to produce less than indica strains. A typical sativa produces three ounces to one pound per plant, while an indica yield is usually between 1.5 to 2.5 ounces each. That being said, sativas are generally more potent than indicas. By cross-breeding sativa and indica strains, growers can create hybrid strains that grow and mature in shorter amounts of time or produce a higher yield according to the wants and needs of marijuana consumers. Experienced cannabis consumers can also frequently tell the difference between sativa and indica by the way the product smells. When comparing sativa vs indica nugs, most people find that the aroma of fresh sativa buds is typically much more pungent than that of indicas. Sativas can smell sweet and fruity or floral and can even have hints of a fuel-like smell. Indicas, by contrast, often smell earthy and musty; some users go so far as to describe the aroma as being similar to a skunk. This isn’t a foolproof way to tell indica vs sativa buds apart, however, as there are exceptions to the rule. Some indicas can have sweet smells, for example, while some sativas are pungent. Indica vs sativa buds impart entirely different aromas. The differences between indica and sativa marijuana strains can cause lots of confusion. Here are some of the questions people most frequently ask. What is the difference between indica and sativa marijuana strains? The difference between indica and sativa cannabis strains ranges from the appearance of the plants, growing times and harvest conditions to the effects of the strains when they’re consumed. Sativa strains are known to create stimulating effects, while indica strains are relaxing and sedating. Is there a difference between sativa and indica high? Many cannabis consumers say that there is a noticeable difference between indica and sativa effects. Most people describe a sativa high as an energizing and uplifting “head” high. Meanwhile, an indica high is frequently described as a “body” high – calming and causing a heavy drowsiness. Do indica vs sativa effects make a difference when they’re used medically? Medical marijuana patients will often choose a sativa vs indica based on the symptoms or condition they would like to treat. Sativa strains work well for depression and ADHD, while indicas are good to calm, promote sleep, and relieve pain. What’s the difference between sativa vs indica leaves? The visual difference between indica vs sativa leaves is another factor that sets the plants apart. Sativa leaves are more narrow and are a lighter green in color. This falls in line with the overall difference in the appearance of the plants, with indicas growing shorter and bushier than sativas. How can I tell sativa vs indica buds apart? To tell the difference between indica vs sativa buds, take a sniff. While hybrid plants can create any combination of scents, a plant that is highly indica-dominant will usually smell pungent, skunky, musty, and stronger, while sativa flowers smell lighter and even sweet or fruity. The world of indica vs sativa offers an infinite array of choices for cannabis consumers. Hybrid strains are much more common than pure indicas or pure sativas. This means that people can customize their cannabis experience based on whether they’d like to experience an indica high vs sativa high. Understanding the differences between the two is also essential for growers. Indica and sativa leaves and flowers differ in appearance and intensity of smell. Maturity, harvest times, and ideal growing climate and location also differ. Those who wish to grow indoors in a small apartment, for example, should research indica-dominant strains that will be shorter rather than taller, sativa-dominant strains. As with everything concerning marijuana, there are exceptions to every rule, and this also applies to the differences that separate sativa vs indica. Plant genetics and harvests, individual body chemistry, and personal preference will all play a part in choosing the best strain to grow or consume. Cannabis Ruderalis - A guide to the effects, uses, and characteristics of the cannabis ruderalis plant.